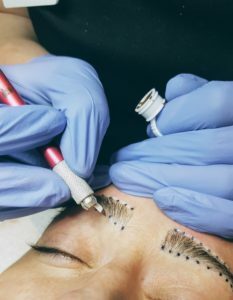 Microblading is a semi-permanent make-up technique which uses a manual pen that inserts pigment into the upper layers of the skin. This technique creates realistic hair-like strokes that can fill, restore, and shape your ideal brow. Beautif-EYE is a licensed and insured salon with impeccable sanitation and extensively trained technicians. 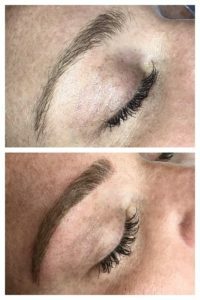 Microblading is a semi-permanent make-up technique which uses a manual pen that inserts pigment into the upper layers of the skin. This technique creates realistic hair-like strokes that can fill, restore, and shape your ideal brow. 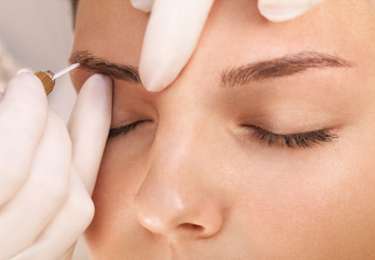 Microblading is perfect for those looking to reconstruct, define, or fill in their brows. It can be used to embellish, or even create a brow that looks natural without the harsh look often associated with tattooed make-up. 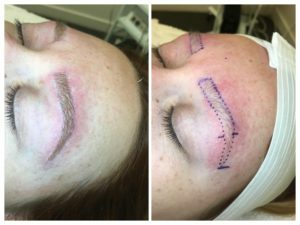 Who Is Microblading NOT Recommended For? The service will typically be completed within 2 to 2.5 hours. 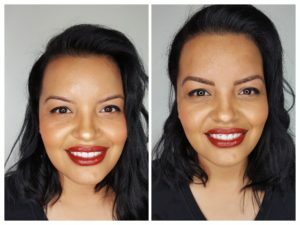 Why Do I Need a Touch-Up Session? Semi-permanent make-up is a two step process. You can expect up to 70% color loss within the first 4-6 weeks. The touch-up session is essential for this reason, and also to perfect your ideal brows. The touch-up session typically lasts 1.5 hours and will be with your original technician. What If I Wait To Do My Touch-Up Session Past 4-5 Weeks? Semi-permanent Touch-Ups included in the standard pricing must be done within the 4-5 week time period to ensure proper maintenance. Delays at 7-10 weeks start at $200, and past 10 weeks is subject to full price. The deposit of $150 is required on delayed touch-up appointments. We start the procedure by applying a topical numbing cream that minimizes discomfort, and use a numbing agent throughout the service. Some clients may experience slight discomfort, but the overall procedure is relatively painless. Clients usually retain pigment 12-18 months after the first touch up. Clients with oily skin may experience faster fading (6-9 months) than those with normal or dry skin. What Should I Do Before And After? Please click the button below to access our full guide on best practices for both before and after your service. Call your desired Beautif-EYE Location to reserve your appointment. Our team will answer any questions, and will schedule the perfect time for your service. Beautif-EYE requires a $150 deposit to secure your spot. This deposit is then applied to the cost of your service the day of your appointment. Please review our Cancellation Policy regarding your deposit, and Download the Consent Form linked below to bring to your appointment! Your appointments are very important to the entire Beautif-EYE Staff, and it is reserved especially for you. We understand that sometimes schedule adjustments are necessary; therefore, we respectfully request at least 24 hours notice for cancellations. As a courtesy, appointments are confirmed 24 hours in advance via automated text and confirmation phone calls. Please understand that it is your responsibility to remember your appointment date and time to avoid late arrivals/missed appointments. Less than 1 day of notice to reschedule will result in a $25 fee (first time only). Less than 1 day notice with no reschedule will forfeit their deposit of $150. NO SHOWS and same day cancellations will forfeit their deposit of $150. Appointments made within 24 hours and need to cancel, the client must cancel within 4 hours of appointment time or will be charged a $25 fee.